One page or two? That’s a surprisingly active source of debate when it comes to résumé-writing. 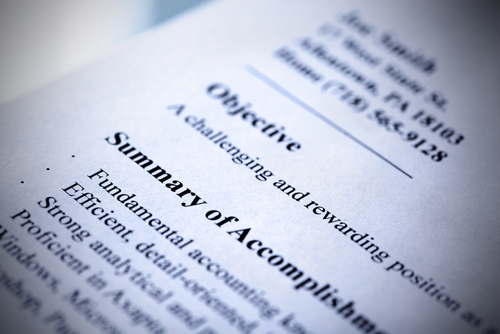 Earlier this year, résumé-writing service ResumeGo conducted a survey of recruiters and hiring managers, and found that two-pagers were perfectly fine—so long as the job candidate was applying for a mid-level job or higher (if you’ve been working for a decade or more, you might need those two pages to fit all your relevant experience). But even if hiring managers don’t mind a two-page résumé for more experienced candidates, can a longer résumé still hurt your chances of landing that initial interview? TalentWorks recently crunched data from 6,000+ job applications (across 66 industries) and concluded that the chances of landing an interview tend to dip once the résumé exceeds 600 words. It did find some exceptions: professors, scientists and researchers all benefitted from having résumés longer than 600 words. But for business-heavy jobs, brevity was best. Just for context, out of 10 résumés randomly pulled from the Dice sample résumé database, the average word-count was 574. However, those samples are deliberately a bit prolix, in order to give readers more “material” to design their own, personalized résumés; in the “real world,” these documents are probably a bit shorter for those with less experience and fewer skills, but probably edge around that 600-word mark for those with a deep tech background. Create a strong first sentence. Don’t rely on a popular template (HR managers know them by heart). Describe how your skills can benefit the company. Proofread the whole thing to death. With a good cover letter (and any other supplementary materials, such as a Github repo of personal projects if you’re applying for a coding position), you can minimize the number of words you’ll need in your résumé, as you’ll have already detailed at least some of your experience and qualifications in that first document. If you feel the urge to pare down your résumé, give it a read-over and make sure that it’s results-oriented and relevant to the position; you can also follow these space-saving tips.